My name is Ceci, short for Cecilia and I am half of Toy Box Tots, renting out boxes of super fun toys to preschoolers across the UK. I have boy girl twins who will turn 3 in the summer and a wild and crazy kitten called Harry. We live in East Dulwich with my husband Marco, having relocated from the UAE 18 months ago. This changes on a monthly basis! At the moment it’s ‘Lottie Potter wants an Otter’ by Jeanne Willis and Leonie Lord . Every couple of weeks we go up to the local library and chose about 10 books to take home and there is always 1 that gets singled out and has to be read at least 10 times a day until we all know it from memory! They always love books where someone or something is naughty or there is some drama or scandal that we can talk about. It’s brilliant for me as I’m always looking for new books to base our toy boxes around so constantly having new books on the scene is great research. The Lion Inside by Rachel Bright and Jim Field has been a favourite of mine since someone gave it to my twins on their first birthday. My twins were born at 31 weeks and my daughter was only 2.4lb whilst my son was almost double that. 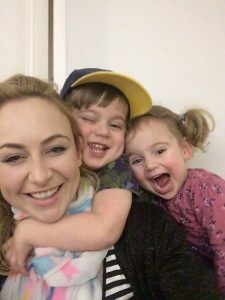 However, Aida from birth has been a terrifying force to be reckoned with; she is small but determined, whilst Danny, my big boy doesn’t realise how strong he is, has a soft heart, a big smile and in incredibly loud roar (sorry Ruby,Ted,Lucy and your mums for being subjected to it). I always think of them as my little mouse and lion and I can’t read that book without crying. I love a book with a good moral and a happy ending! Our very first Toy Box Tots box was based around this book. What do you look for when shopping for a new book for your children? At the moment, as my twins are toddlers, I love a book that helps them understand a new situation. For example, one of our 2-3 year old toy boxes is based around a book called King Cat which is all about a cat being very comfortable with it’s life and then suddenly a dog arrives on the scene and although it is very confused at first, it eventually learns to get along with it. Lot’s of toddlers are dealing with the arrival of a new brother or sister and so this book helps them see how to adapt. Similarly, we borrowed (the dreaded) Peppa Pig at the Dentist before our first trip to see the dentist so when we arrived there were no issues at all and they opened their mouths and sat calmly as if this was the most normal thing in the world. We are currently working on a few different rental boxes to help preschoolers understand a new situation including moving house, going on holiday, a new baby, starting nursery or moving to a big bed so look out for those! Who is your favourite children’s author and why? As a child it was definitely Roald Dahl for me. His books were the first books I really remember reading on my own, taking on holiday and reading over and over again. They came alive in my imagination and I could get lost in his words. I loved Matilda, Essio Trot and the Twits and we have a beautiful print from Danny’s godmother in the playroom from Danny the Champion of the World which I can’t wait to read to him when he’s old enough. In all honesty I think a lot of today’s books are absolutely brilliant. I spend a lot of time reading old books from my childhood and some of them are totally unusable in our toy boxes as they’re so old fashioned! I would hate to list them as they’re wonderful books but are outdated in their visions of Mummy staying home doing the washing and cooking whilst Daddy goes to work. Now there are incredible books like Suzanne Hemming’s ‘She’s Not Good for a Girl, She’s Just Good!’ and Andrea Beaty’s ‘Ada Twist, Scientist’ which are wonderful books for our children to grow up reading, encouraging them to be inquisitive, determined and follow their passions. 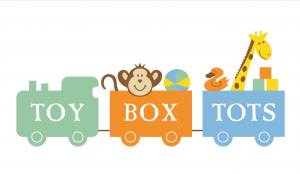 Toy Box Tots provides carefully curated boxes of toys to rent for preschoolers across the UK. Each toy box is lovingly based around a child’s book, creating a passion for reading and fostering young imaginations. Although the toys are returned to us, the books is yours to keep.